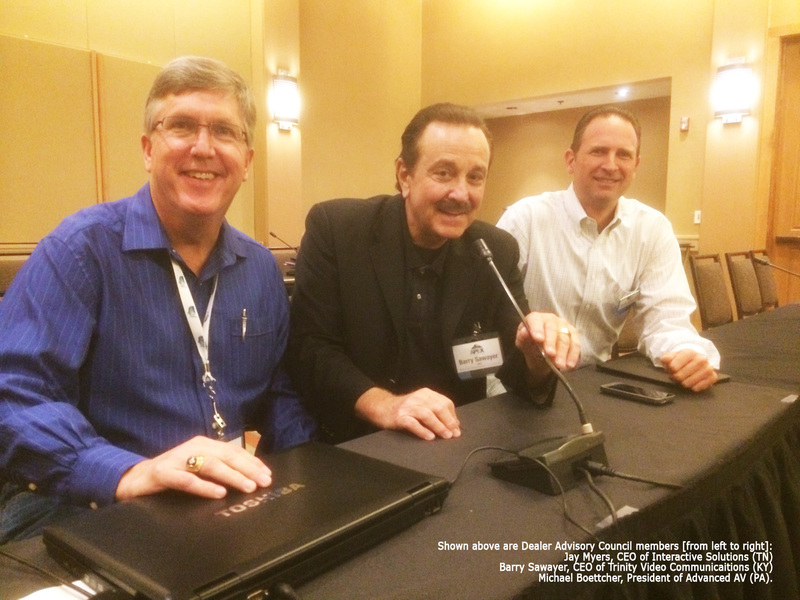 Members of USAV, an association of leading professional audio-visual (ProAV) integrators, recently met in Colorado for the 2014 October Integrators’ Meeting, where industry professionals came together to discuss best practices and challenges facing the ProAV industry. One session of particular interest to event attendees – The DAC (Dealer Advisory Council) Attack: An Open Forum – provided the opportunity for members of the USAV-DAC to address questions from all the USAV Integrators, while also working together to discover new and innovative solutions. “This was an informative and collaborative event hosted by USAV,” said Trinity Video Communications CEO Barry Sawayer. “I especially enjoyed the DAC Attack open forum. Having the opportunity to brainstorm with other ProAV experts is extremely valuable and I feel important for the overall health of the industry,” said Sawayer. For more information about this year’s event, visit www.USAVGroup.net. Trinity Video Communications is an audiovisual and video communications company that provides commercial clients with state-of-the-art technologies that transform the way they communicate, interact and do business. Trinity also provides real-time unified communications to government agencies including the Department of Justice, Department of Defense, Homeland Security and law enforcement agencies at the federal, state and local levels responsible for mission critical initiatives. Trinity is headquartered in Louisville, Kentucky with additional offices in Sterling, Virginia and Cincinnati, Ohio. For more information, call 800-261-9008. USAV is the definitive alliance of ProAV integrators delivering ProAV solutions across the United States. The company, headquartered in Denver, has dealers throughout the country. Each dealer is dedicated to designing, sourcing, implementing, and supporting commercial ProAV projects. Founded in 2001, USAV has attracted leading dealers and manufactures in forming the nation’s premier ProAV team.